Kelly Newton, CGA, of Newtonâ€™s Jewelers in Fort Smith, Arkansas, is the recipient of the American Gem Societyâ€™s (AGS) most prestigious honor, the Robert M. Shipley Award. Mr. Newton was presented with the award at the Societyâ€™s annual Conclave in Seattle, WA, that was held earlier this month. 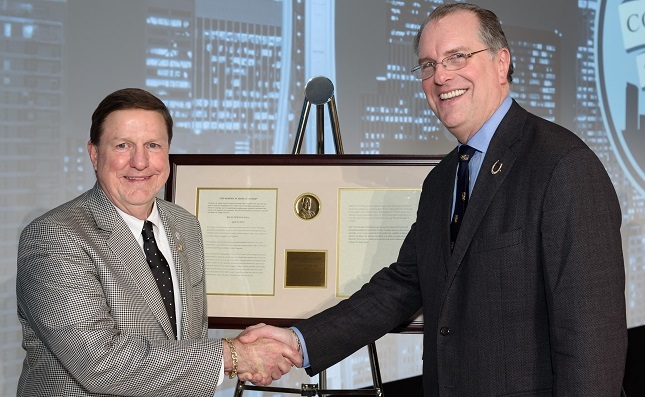 "Kelly sets the standard for what an AGS Jeweler should be and what the Shipley Award stands for," said Doug Parker, a past President of the AGS Board of Directors and current chair of the Robert M. Shipley Nominating committee. "He gives freely of himself to AGS, the industry, his community and his church. We are very proud to honor him with the 2019 Robert M. Shipley Award." Kelly Newton is the third-generation owner and president of Newton's Jewelers. Heâ€™s been a member of the AGS for 25 years. In 2010, he began serving on the Board of Directors and he has served as chair of the Membership Committee since 2014.For the past seven years, he has served as chair of the Societyâ€™s Grievance and Review Committee. Newton volunteers extensively in his community and supports many charitable and civic causes.